All students who can play any instrument or sing are welcome in the working group Music. There is no stilistic guideline. 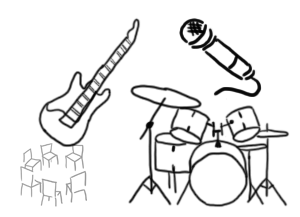 Depending on the number of band members various formations are possible, like a Jazz trio, an acapella group, marching band, rock band, and so on. The rehearsals are once a week. The band is always openminded for new members and ideas. So everybody being interested in gain an insight into performing own songs, recording, sequening are invited to come around. The students receive no ECTS-credits for the music sessions.